As you scan the grain elevators that dot the landscape across southwestern Nebraska you will notice how many of them host microwave antennas and small industrial cabinets that house Ethernet demarcation devices (EDDs), which are vital gateways for rural communications services. In the Midwest Even EDDs Must Embody Rugged Individualism More recently, to gain more efficiency and greater control over the traffic traversing their network, ATCjet sought to deploy a more robust EDD. An EDD that can provide, among other things, advanced traffic management capabilities, support for network resiliency functions like Ethernet ring protection switching and link aggregation, Y.1731 performance monitoring capabilities, and 1588 v2 advanced timing. Also, it needed an aggressively hardened unit capable of enduring the temperature extremes, hot and cold, to which the Nebraskan plains are prone. 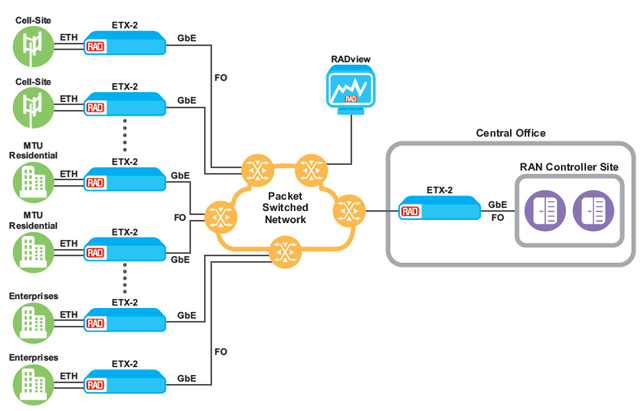 Gain more efficiency and greater control over the traffic flowing through the network. RAD’s SAA solutions based on the ETX-2 family of IP and Carrier Ethernet demarcation devices. They chose RAD’s CE 2.0-certified ETX-2 Carrier Ethernet demarcation/mobile demarcation devices, part of its Service Assured Access (SAA) solution portfolio. SAA makes it easier to plan, deploy, provision, and maintain existing and new services, allowing operators to offer a resilient, always-on service with predictable quality of service (QoS) and better quality of experience (QoE). “The ETX’s traffic management capabilities enable us to maintain a much ‘cleaner’ network. With the ETX, we are able to maintain strict control of the network ingress, without any of the congestion that affected the previous installation,” noted Donnie McCorkle, ATCjet’s Information Systems Engineer. Everyone Needs a Good Support System The initial ETX deployments have been in service for nearly a year now, and, according to McCorkle, the installations were “flawless – absolutely flawless!” and he plans to deploy them at approximately 30 sites overall. The RAD technical support team helped ATCjet configure and turn up the devices. Along the way, based on some changing needs, they also helped ATCjet make some configuration modifications.